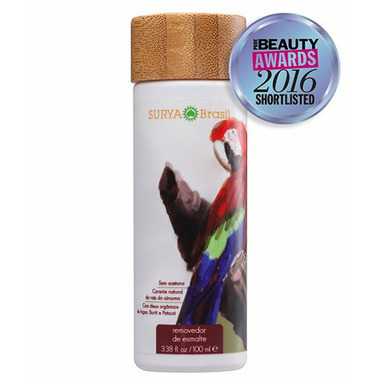 Gold Winner as Best New Organic Product of Pure Beauty Awards 2016! The Exotic Animals Organic Nail Polish Remover is all natural, organic, and vegan. It contains eco-friendly renewable solvents and vegetable glycerin. Its Patauá, Argan and Buriti organic vegetable oils provide hydration preventing dryness and white spots on the nails and cuticles. Does not contain Acetone, BHT, Formol, Glycols, Mineral Oil, Parabens, Liquid Paraffin, Silicone, or Toluene. Free from ingredients of animal origin and never tested on animals. Ingredients: Ethyl Lactate, **Alcohol, Aqua, Glycerin, Parfum, Propanediol, Tocopherol, Helianthus Annuus Seed Oil, Coconut Alkanes Coco-Caprylate/Caprate, *Mauritia Flexuosa Fruit Oil, *Oenocarpus Bataua Fruit Oil, **Argania Spinosa Kernel Oil, CI75300. This product contains synthetic fragrance. I do not recommend that anyone use this product. This company should reformulate the product and make it fragrance free or use an essential oil instead of chemicals to create scent.